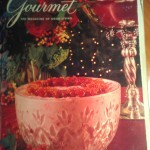 The ghost of Gourmet Magazine past visits my kitchen every Christmas. That’s because for almost 20 years I’ve been making the Biscotti di Greve recipe from the December 1992 issue to give as Christmas gifts. I always enjoy getting the magazine off the shelf and studying the fluffy intensely-pink dessert that is pictured on the cover and flipping past the NordicTrack ad to get to page 164. By now though, I’ve used the recipe for so many years that the page is so crusty and spattered that the magazine practically opens by itself. Because we moved a little more than a month ago and all our routines have been shaken loose, I wasn’t sure I would continue with the biscotti baking tradition. 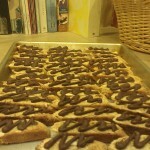 I love making them but baking 20 dozen biscotti is time consuming and our lives in 2011 have been all about downsizing. So maybe giving homemade gifts was another aspect of my life that could be simplified. I could make one trip to our neighborhood Target and I could be done – no fuss no muss. 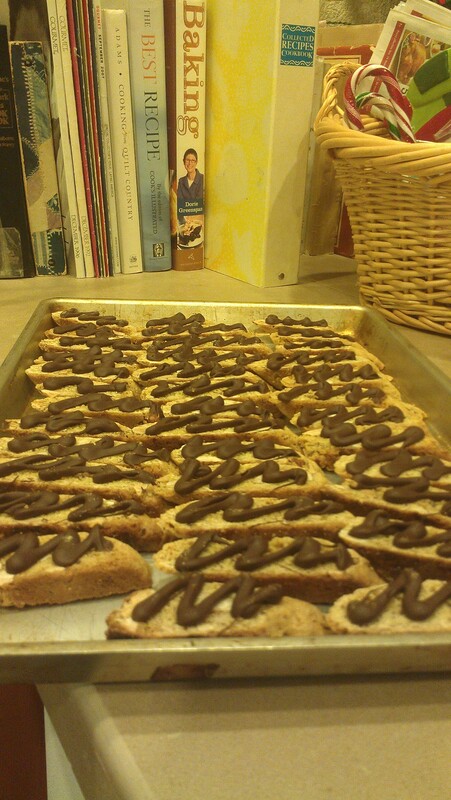 But after Steve and I talked about it, baking the biscotti again this year just felt right. I know at least some of the recipients truly look forward to getting them and would actually miss it if they didn’t get my “I hope you don’t have any loose fillings,” crunchy almond orange biscotti. Besides, if you’re going to give a homemade treat as a gift, I think biscotti are the perfect choice; they are practically guilt free because they have so little fat and not all that much sugar in them. Plus, there’s no such thing as a stale biscotti so they will taste just as good in January when all the other holiday goodies are long gone. And when something works, why change it? Although the thought of going to Target and just picking something off the shelf instead of making the gift myself sounds appealing, the reality is much more that I would spend two hours wandering the store only to come home frustrated and empty-handed because I couldn’t find anything that would be appropriate and affordable to give clients, friends and family. The smell of them baking would also help our new place feel more like home. I don’t need to just make biscotti, I need to make some happy memories here too. And there’s one more reason why I should make them again this year. How could I pass up the opportunity to say we’re giving biscotti from Cotati…it has such a nice ring to it. 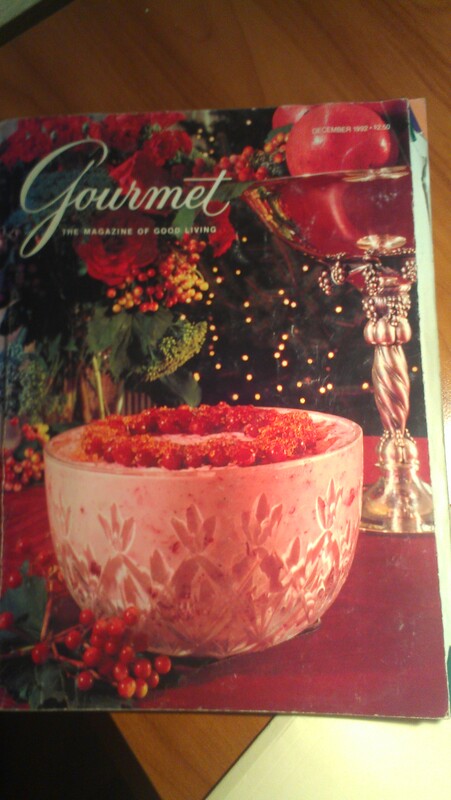 This entry was posted on Sunday, December 18th, 2011 at 10:50 pm	and is filed under Christmas, Family, Home. You can follow any responses to this entry through the RSS 2.0 feed. You can leave a response, or trackback from your own site.